Everyone knows Windows, Apple, GNU/Linux and the BSDs. These computer operating systems have been around for 10-20 or so years and people know what they provide and how they function. However, there are two other OSes that sound as though they come from English class: Haiku and Syllable. 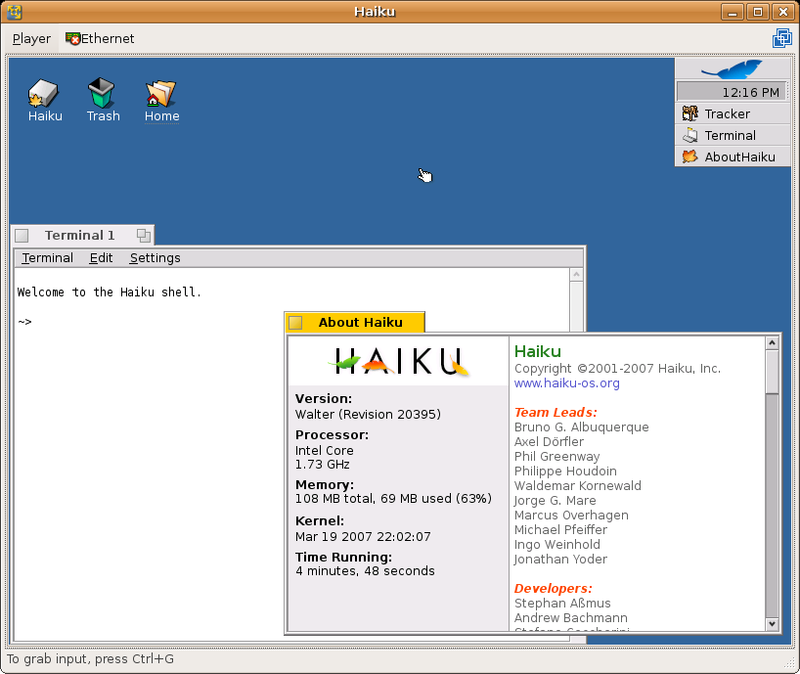 Haiku is a free software version of BeOS, an operating system that existed in the 90s around the time of the tech boom. Originally they ran on PowerPC processors and, even though they were considered to be superior to most other OSes at the time, it did not gain significant market share. This is not the first time this has happened. Betamax, for example, was technologically more advanced than VHS – but VHS offered other advantages. In the realm of computers, Amiga was superior to everything else around. It was the best for audio and video and still is used by a large number of users. At the time, its hardware was so awesome, people created “demos” with it to showcase the amazing graphics and sound. Yet, a mix a horrible management and the entrenchment of Apple and Windows caused it to lag behind until the other operating systems (and hardware) finally surpassed it and it no longer had any advantage for use. BeOS was another awesome OS. Neal Stephenson in his essay, “In the beginning was the command line“, called BeOS the Batmobile – the ultimate power computer. According to people who still use it, 10 years later, BeOS was so well coded that, with the hardware of the time, it was able to do amazing things like decode more than one video stream at once. It was known for being very good for multimedia applications and video editing. In fact, there are still some companies which make dedicated video editing and compositing machines based upon BeOS. With all this heritage, many people are anxiously awaiting the release of Haiku. They can’t wait to harness all of that power. BeOS was unable to get Apple to buy them and use them as the basis for OSX, so they went under and eventually had their copyrights and trademarks acquired by Palm. Palm did not continue to release BeOS – so people were left without an alternative. Haiku will avoid that because it is free software so if these guys don’t feel like maintaining it anymore, others can take it and continue to work on it. I don’t know as much about SyllableOS. I do know it sprung up from AtheOS. Both SyllableOS and Haiku do not have legacy code – in other words – while Windows was built on DOS and Linux was built on Unix, BeOS and Syllable were built with new technologies already existing. What does this mean for the end user? Well, since Windows is built on legacy code, it has to continue to support old technologies and patch in new technologies. Other than make it easier for virii to attack Windows, just think of how anything works when you have to patch it to work with new capabilities. Look at cars and other things where you add new functionalities – it just won’t be as stable and functional as if it were built it. Similarly, Linux and its GUIs are built upon the command line. This causes certain assumptions which mean that running Linux with a GUI will not work as well as the command line. Is this a large effect? I don’t know enough about computer science to answer well, but BeOS and SyllableOS have the GUI technologies built in, so it SHOULD be more efficient. So, those of us who use free software are used to operating systems coming with useful software built in. Unlike a default Windows install that doesn’t come with any functional software, Linux and FreeBSD come with office software, many games, educational games, graphics software equivalent to Photoshop instead of the crap that is MS Paint, FTP software, IDEs, and more. Thus I wanted to see how viable these new OSes are. There are a lot of operating systems out there and people want something they can be productive and have fun with. Which of these two OSes is ready for primtetime? Might one of them steal the desktop thunder from Linux? (Thus leaving it for the server and other stuff) So I will test them in terms of internet, chat, email, graphics, playing music files, watching videos, and playing with games. This is a very basic set of functionality and if the OS can’t do this – it might be falling behind. I tested these in VMWare so your mileage may very in terms of functionality if fully installed on your hardware. Also, Haiku cannot currently be installed as a primary OS. Here we go…. You can see a couple of icons and the Leaf menu on the top-right corner. This functions as the taskbar in Windows, Linux, and other OSes. It also opens up a defaul terminal shell. So, while Haiku has the GUI built in and optimized, the terminal is there for you to do things just as in Linux and BSD. 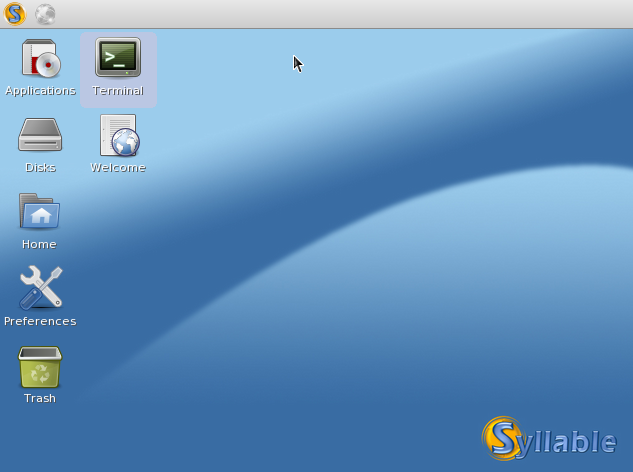 To open up a program, either click on the leaf menu or right click on the desktop. Haiku does not seem to have an Internet Browser built in. There are Firefox builds for BeOS that should technically work, but I was unable to get it to work with the Haiku VMWare image. The problem is that the VMWare image was made with only 100 MB of disk space with only 20 MB available. That’s not enough space for untarring and installing Firefox. I am only using VMWare Player (not one of the more advanced VMWare programs) so I am unable to increase the disk size. If there’s a way to do it, I certainly don’t know about it. However, I was able to get one of the textual broswers to work. Still, I think it’s very important for an OS to come with an internet browser, especially with how important the Internet is nowadays. It can be a rebuild of Gecko/Firefox such as Epiphany, a rebuild of KHTML such a Safari, it can be their own native program, or it can be Firefox, simply compiled for BeOS. I think they need to solve this by the time they start releasing their milestone release. Haiku appears not to have a native chat program. Perhaps I am wrong, but I couldn’t find one. Feel free to leave me a comment with corrections and I’ll fix it up. Here you can see that Haiku is able to open up PNGs. I took a screenshot of Haiku from within Haiku (thus demonstrating even another ability) and was able to open up the PNG. So you can open up images – again – a VERY basic functionality, but when recoding from scratch – it should not be taken for granted that any certain functionality is there. I loaded up an ogg because if you can’t play the free, unencumbered format – then you can’t. It looks as though the media player can read the file and see which library to load. However, I fail to hear any sound or have any indication that it’s playing. Perhaps that hasn’t been implemented or perhaps it’s because it’s vmware. For the purposes of this test, it can’t play music. For the video test, I wanted to use one of my Xvid-encoded videos. However, there was not enough space on the VM. Haiku does not appear to come with any games by default. Of course, it may be that they are waiting to include those until after they reach their first milestone. Alternatively, they may be relying on people using games from BeOS, since there is binary compatibility with the last version of BeOS. You can see it has a few icons and a taskbar at the top of the screen. It looks a bit like a Windows desktop, but with the bar at the top like in a Macintosh or a Gnome desktop in Linux. Because the available images are for testing/debugging purposes, they only include the base OS, which does not have any apps other than those needed for setup and a few demos. There is a lot of BeOS software that will run in Haiku (with different degrees of success), and most of it is available for download from bebits.com. A fair comment. I was merely looking at them from the point of view of a Linux user. Linux comes with everything you need already installed whereas Windows does not. So, sure there’s a ton of freeware for BeOS/Haiku, but that also holds true for Windows. Of course, I was also trying to just look at two niche OSes. I know Haiku still has a ways to go, but I wanted to see where it is now and if it would be viable for everyday use. My conclusion – not quite yet, but getting there. I’ve been trying to get Haiku working as a VM in VMware Server for a few days. I found your blog post useful for this. However, although it works fine I just can’t get an internet connection (I’m not worried there’s no GUI browser, I’ll use Links). I’ve been using this link (http://haiku.mlotz.ch/) to try for the internet connection but haven’t got very far. However, I have no idea how to compile this into a workable network driver if this is what’s required. If I do “ifconfig /dev/net/ipr1000 down” the “up” goes from the ifconfig output. So that looks promising but pinging gives total packet loss. I would be grateful if you could point me to a guide to get me over this important obstacle. I’d like to help you with that, but the Internet connections just worked for me. Thanks for the reply, Eric. Actually, this problem was relatively easy to fix (which is very often the case with seemingly insuperable difficulties). I just had to make sure that the Network setting for the VM was at Bridged rather than Nat. After that everything worked perfectly and I haven’t looked back since. That’s what I figured. How are you enjoying Haiku? Do you currently run BeOS? 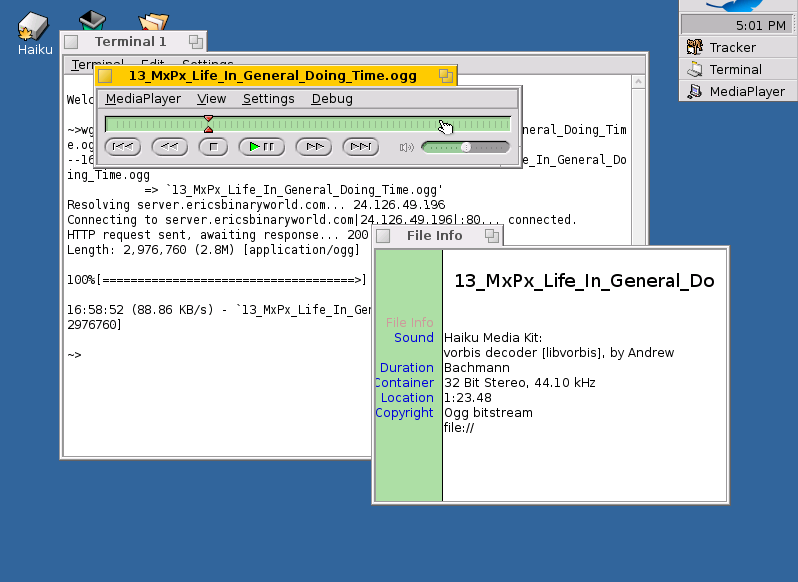 Actually I only heard about BeOS/Haiku a couple of weeks ago (in LifeHacker, I think) and decided to have a look at Haiku. Despite having been in development for quite some time, it is still very limited. On the pther hand, of course, it is very very small (first one I tried was 100MB, but now I’m using the weekly super-pack which is about 500MB). Even so, its browsers FF and Opera are almost unusable (particularly Opera) so I’m using Links which is a text based browser but very fast. Haiku, in my view also suffers from not having a lively forum or good documentation. Nevertheless, I am interested to be involved in something that may well develop into a very useful new OS. However, I have to say that, from my perspective (and I know I’m using it as a VM), I don’t see an awful lot very different or special here right now. But let’s see how it develops. I think Haiku could eventually become extremely powerful as a desktop considering how amazing BeOS was when compared with the OSes of the time. Time will tell. For now it’s just a toy I check out every few months.